EV maker opens ordering process to everyone. Tesla opened up the ordering process for the Model 3 to everyone, not just those with invitations. Looking to generate more sales — and perhaps more importantly, the cash from reservation deposits — Tesla opened the sale of its entry-level sedan, the Model 3, to anyone who wants to go online and order one. 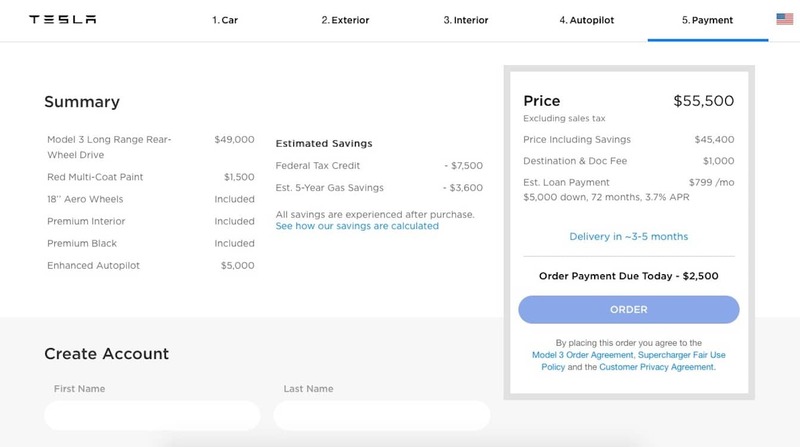 Prior to now, buyers needed an invitation to purchase the Model 3. 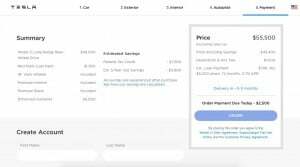 Now anyone can go online and place an order; however, the big catch is the $2,500 deposit required at the time the order is placed. The buyer will get a delivery date after the deposit is accepted. The website currently states delivery can be take three to five months. The deposit is non-refundable, which is different than what earlier, invite-only orderers were allowed. Reports suggest that nearly a quarter of the 400,000 potential buyers who plunked down deposits have cancelled their orders. Since CEO Elon Musk told investors recently the company would be in the black in the second half of this year, the move to open up the ordering process to everyone may be a simple way to offset repaying about $100 million in deposit money. Wannabe Tesla Model 3 owners no longer need an invitation to order the entry-level sedan: just cash. Tesla’s endured a tough first six months of 2018 as it attempted to get production of the Model 3 online. The company went through what CEO Elon Musk called “production hell” at the company’s Fremont, California plant. 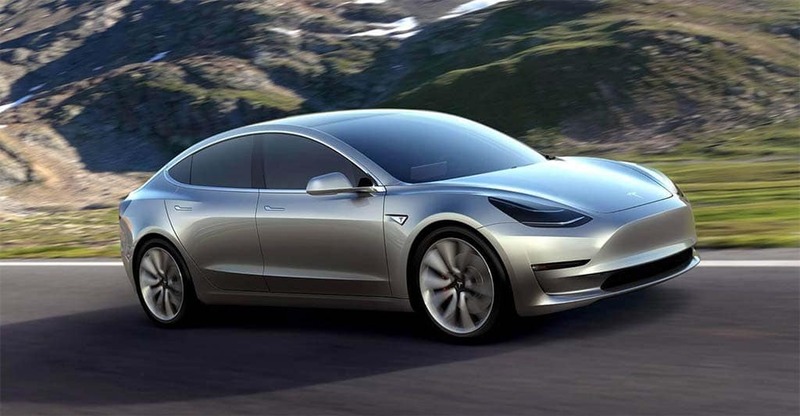 The company missed several production benchmarks, finally getting to its revised prediction of 5,000 Model 3 sedans manufactured per week just two weeks ago. 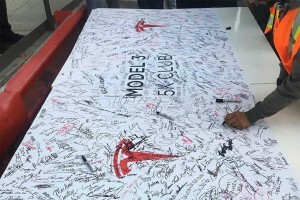 The effort required Musk to set up a temporary production line in a tent adjacent to the plant. Musk, who spent nights sleeping on the shop floor in recent weeks, said the plant may have been too automated, complicating the production process. However, a recent tweet from Musk indicates that since getting to the 5,000-unit per week number, the levels have been holding steady. The Model 3 starts at $35,000, but the price can quickly rise to well over $50,000. Currently, Tesla’s vehicles are eligible for the $7,500 tax credit, but those are limited to 200,000 vehicles per company and Tesla is racing toward that number. The company is under incredible pressure to produce a profit in the next quarter after Musk guaranteed the company would be in the black by the end of the year. 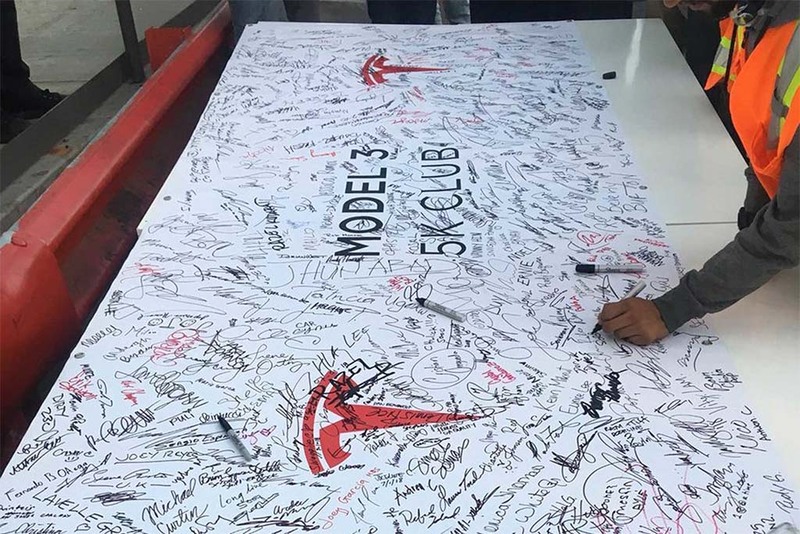 Fremont workers were invited to sign a poster proclaiming Tesla's new "5K Club." The company delivered record losses during the first three months of this year and is expected to remain deep in the red through the end of June. The longer-term question is whether Tesla’s rising production of the critical Model 3 battery-sedan will finally translate into the black ink and positive cash flow Musk has repeatedly promised. For now, however, it appears that a growing number of analysts aren’t particularly optimistic. Of the 31 analysts who cover Tesla shares, 10 now offer “sell” guidance, nearly one in three. A roughly equal number list TSLA shares as “hold,” with only a third now recommending investors “buy.” It is rare, according to the Bloomberg news service, for analysts to go with a “sell” rating, most signaling displeasure with “hold” guidance. It has been barely months three months since Tesla’s stock bottomed out, tumbling by more than a third compared to its previous high. The current downturn would have to turn into a full-fledged rout to come close. Analysts say it’s more likely TSLA shares will bounce around in the coming weeks as everyone waits to see what the company’s second-quarter earnings looked like – and hear what Musk has to say about the future. This entry was posted on Tuesday, July 10th, 2018 at and is filed under Automobiles. You can follow any responses to this entry through the RSS 2.0 feed. Both comments and pings are currently closed. “…buyers needed an invitation…”. Are you kidding me? This is the first time I have heard of that. “… the big catch is the $2,500 deposit…The deposit is non-refundable…”. Please don’t tell me anyone is actually going to do this…..not with all of the other BEV vehicles available now, let alone those that will be available by the time these new customers will ever see their new Tesla.